This English teacup trio (consisting of a teacup, saucer and matching 'tea' or cake plate) is a true antique from the Victorian era. The beautiful transfer printed ornate gold pattern is very beautiful. It is highlighted with the most wonderful hand painted turquoise dots, which stand out like little jewels. The pattern really stands out against the bright white of the china. There is no maker's mark, but the pattern and shape is very Victorian and English. It is highly likely that this trio was manufactured in Stoke-On-Trent, the heart of the English potteries. 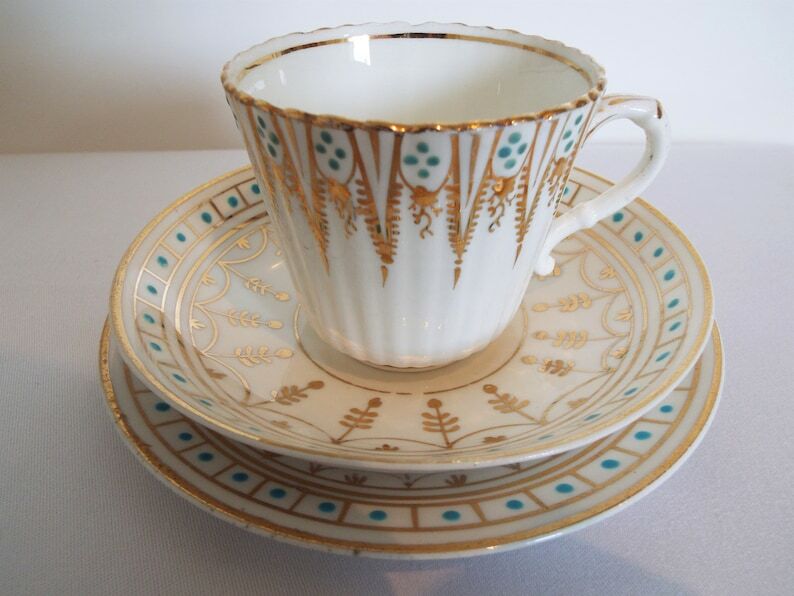 This teacup trio is a beautiful example of an English tea party table setting from Victorian England. Elegant and eye catching, this gold, turquoise and white pattern is just as lovely and desirable today as when it was made in the nineteenth century. The fancy rippled shape of the teacup is especially elegant and adds to making this tea set feel very special to use indeed. This trio would stand out proudly on your tea table and would also display beautifully. It is perfect for serving tea and cake at a quintessentially English teatime and would make a wonderful gift for a birthday or special occasions, such as Mother's Day or Christmas. In very good antique condition, no cracks or crazing to the glaze. There is a little rubbing to the gilded pattern in places (mainly on the tea plate - see photo 4), but this is minor and commensurate with age. There are some little tiny pin prick sized flecks in the china in places, this is a natural occurrence of the contemporary manufacturing process at the time and reflects the trio's history. Photos 7 and 8 show some small chips out of the saucer and tea plate footed base, which are very minor and do not affect the attractiveness or usability of this trio at all. Obviously they cannot be seen from the pattered upward side and do not affect the stability of this trio in any way whatsoever. Any further wear or marks are commensurate with age. Your item will be prettily gift wrapped for free in vintage style brown paper and ribbon. Please see some of my other listings for examples of my pretty packaging. **Due to value, this item will only be posted 1st class 'signed for' to UK destinations. It will only be posted tracked and/or 'signed for' (depending on availability at the final destination) to international addresses outside of the UK.